I was so, so happy with how this recipe from my friend Ruth (from ) turned out. It smells wonderfully. It is easy to make. And it works really well. I realized after mixing it up that I don’t have a funnel. So I improvised and used my tea pot instead. Hey, it was a little non-conventional, but it worked! 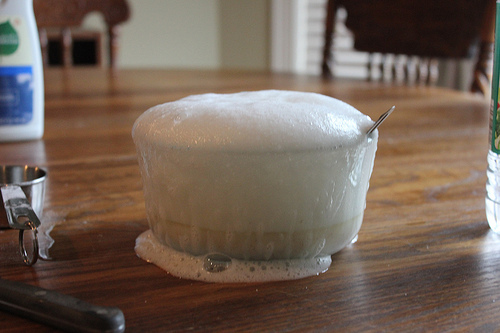 And then I used the spilled cleaner to scrub my clean off my kitchen table. Mix all ingredients together in a large bowl. Pour into a plastic container with a lid. You can use a spray bottle (that’s what I had), but since the mixture is thicker, I couldn’t get it to spray out of my cheap spray bottle. 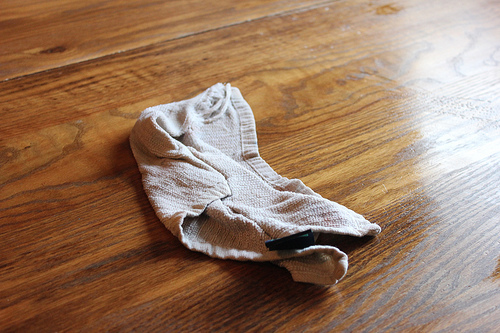 To use: Shake and pour a small amount onto a rag or directly onto the area you are cleaning. Scrub and then rinse with water and wet rag. See more homemade cleaner recipe ideas I’ve tried here. Does it have to be a plastic container?? I have some old olive oil jars, that would probably be perfect, except they are glass. Let us know if you try glass. I think it should work. But I can’t say for sure since I’ve not tried it! I’ll have to try this. I have 3 boys (4 if you count dh). LOL. I usually just use a bleach wipe daily on those hinges and base. I’ve been using the same plastic bottle for my window cleaner (vinegar, water, and a touch of detergent) for over 5 years and it is still going strong. 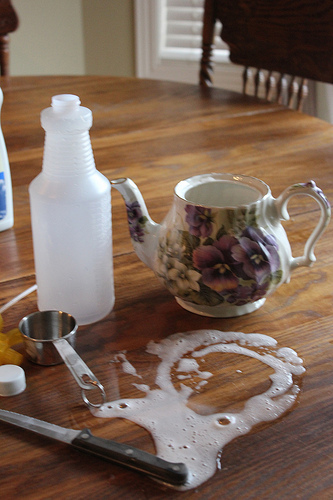 Did you ever try the cleaner….equal parts Dawn dish soap and Warmed vinegar mixed well in a spray bottle! 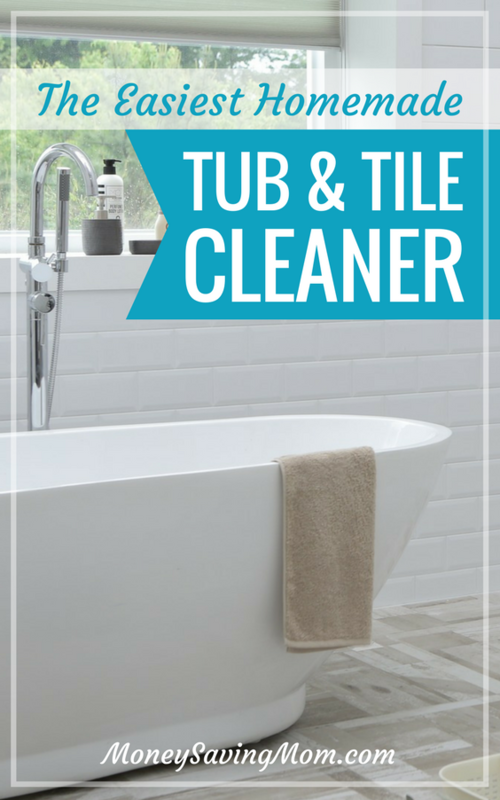 Cleans my bathtub of grime from the dirty hubby like a charm! I am totally trying that the next time I actually have Dawn on hand… I’ve heard it only works with Dawn. Is that right? I got to try that! Thanks for the idea! We did the warm vinegar and dawn and it made fumes so strong I couldn’t be in the bathroom. It just about choked my husband! I’ve read that those horrible fumes are caused by heating the vinegar. I don’t heat the vinegar and I don’t have the fumes – just smells clean and fresh like the dish soap and seems to clean really well without having to scrub. I use Palmolive and vinegar in my shower and it works great! I just poured some vinegar into the palmolive container (about equals parts soap/vinegar) and just squirt some onto a sponge when I shower and wipe things down. I’ve been very pleased, and it is so easy! Hi – does this recipe keep for awhile or do you need to make it when you want to use it? Thanks – I love these cleaners. Mine sits in a spray bottle under my sink for months on end. It stores fine. Once the baking soda and vinegar have neutralized each other, how does it clean? I think those are just to provide some liquid and consistency to the cleaner. The salt and lemon juice and dish soap do most of the cleaning. You could leave the baking soda out, but I think it help it achieve a better consistency for scrubbing. I know this is an old comment but felt this might help someone else along the way. The consistency is like a loose soft scrub but I wouldn’t try it in a spray bottle. Instead save a dish detergent bottle or something like a soft scrub container for this. I use just the vinegar and any dish soap in my shower cleaner and it works great for most of it, I occassionally have a spot that needs more. I don’t have any fume issues but I never heated the vinegar since its not really needed and is not practical to do each time. Thanks for asking this! I wanted to know the same thing, but the word “neutralized” was not coming to me. I think you should be able to store it without any issues. I absolutely love the idea of using more natural cleaning solutions. I don’t like the idea of breathing in the harmful fumes emitted by the store-bought cleaning products. It’s one of the reasons that I dread cleaning. I’ve tried cutting the chemicals w/ water….. helps some, but I feel that the smell is still too strong – and it lingers. Opening windows and turning on fans does help. I feel assured that the natural cleaning solutions remove visible dirt. My only reluctance is that I wonder if they deodorize and disinfect/sanitize as well as the store-bought cleaning products. I’d love to know what others have experienced w/ regard to my concern. Vinegar, lemons, and essential oils all have antibacterial and antiviral properties. If you do some googling you’ll find a wealth of info and scientific studies on the subject. The deodorizing you’re getting, vinegar, lemon juice, and baking soda each have their own deodorizing properties (so you’re good there). As far as disinfecting, hydrogen peroxide and alcohol are two very good choices. Vinegar does kill quite a bit itself, but for a good solution, use equal parts alcohol and vinegar (what ENTs use to put in children’s ears that have chronic cases of swimmer’s ear). If you are really worried about disinfection, give a good rinse off with whatever solution you choose, and let stand. When you use those nasty chemicals, even bleach, unless you let it stand until dry without rinsing, you really aren’t killing anything. It’s time the chemical that disinfects. THANK YOU for posting this. I’ve tried some of the other recipes (warm vinegar, baking soda and Dawn, etc.) and they didn’t do a darn thing except make my tub slippery. I needed to clean my tub today (good timing!) so I gave it a shot and it was great. I think the inclusion of the salt in this one gives it the scrubbing power necessary for cleaning a tub. Anyone know a good way to get baking soda in bulk? It would be nice to have a larger amount on hand when I want to use it for things like this. I’m so glad you found it to work well. I was excited at how well it worked, too! Check Sam’s Club – that’s where I get ours. A gigantic bag costs about the same per ounce as getting the small boxes from Aldi. Check samsclub.com and you can find out exactly how much a bag costs at your local store (love that feature!). Thanks! We have a BJs membership, but I’ve never thought to check for baking soda there. Here’s hoping they carry it like Sam’s does! I am sure they have it, likely in the baking section. I buy the 13.5 lb bag at our Costco for very little also, think it was less than $6. It was less than buying the same amount in tiny boxes from Aldi for me also. Walmart’s 12lb bag price is $7.57 in my area. They sell big boxes at Walmart for just a couple of dollars. In my local one its right across from the laundry soap….right next to bar soap and washing powder, and borax for making homemade laundry soap. We buy big bags of baking soda, sometimes at Sam’s club, but we also get them at Wal-Mart in the swimming pool supply section during the summer–people use it to balance pool pH. Amazon has big bags of baking soda. It’s used for pool cleaning. I think it’s an 8lb bag. Check on amazon shopping for bulk baking soda is edible grocery item so ask local bakery where they order theirs from they may order it for you and u pay the bakery good luck. Hydrogen peroxide all over dirty old tile bathroom reveals nasty overflow from boys then sprinkle after heavy foaming sprinkle well box of baking soda leave on floor for 30 min then scrub w short bristle brush broom let sit again 30 min then mop up even grout is brighter. Happy cleaning with less expensive, no chemical cleaning ! Thanks so much for this. I need to work on our showers this week so this is great timing. I’ve tried the Dawn/warm vinegar recipe and found it did really remove soap scum, but was very slippery and required lots of rinsing to complete my task. Looks like this will be very economical, and even moreso if I use plain old salt instead of the RealSalt you have pictured, but I totally understand using what you have on hand, too. I have not found a source to get RealSalt cheaply. It’s stilk not “cheap”, but we buy RealSalt at vitacost. I have not warmed the vinegar ever and do not use salt and it works very well. No baking soda either. Just vinegar , dawn and some water, not a lot. Cleans shower walls and tub like new. Where do you buy your essential oils? And what is a good price? https://moneysavingmom.com/2013/03/weekend-giveaway-essential-oil-kit-from-plant-therapy-6-winners.html I’ve been impressed with their prices. Plus, they have free shipping. And if it’s not in your budget, you can leave them out of this recipe. The good thing about essential oils is that one bottle lasts for a very long time since you’re often just using 8-10 drops per recipe. I’m a little concerned about the salt – could that scratch the tub? I had the same concern. I’d test it on a small area to be certain. I guess most cleaners, natural or not, have the potential to damage porcelain, marble, laminate, etc., and you can’t know if someone else has the same finish as you do, so I’d test to be sure. Sounds great! I will definitely give this one a try. 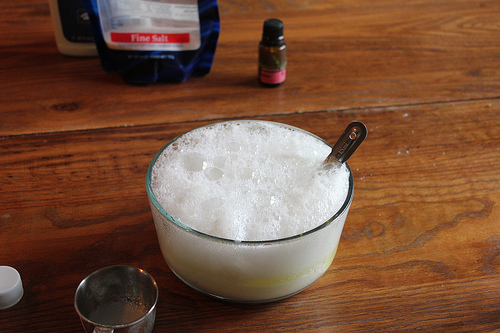 I use baking soda or vinegar for all my cleaning. The only thing I have to use lots of elbow grease on is my shower floor. Even though the baking soda and vinegar in this recipe will neutralize, just be aware that vinegar can etch stone if you use it alone or it is not neutralized. As can lemon juice over time. Sorry, lol. Just read your instructions more closely and got my answer about the spray bottle! I am very sensitive to the smell of vinegar to the point that I don’t enjoy my meal if sitting too close to someone eating a vinegar – based salad dressing. I love the idea of making natural cleaning products but the thought of having that vinegar smell around all the time has kept me from doing so. I used it to clean my son’s asthma nebulizer but that was a very occasional use. Does the lemon juice or essential oil knock out that vinegar odor? Lemon juice and essential oils can block out much of the smell but its not completely gone. But there are alternative recipes that you can use instead such as ones with isopropyl alcohol or hydrogen peroxide that work as well also. I have used isopropyl and water in equal amounts which works incredibly well also. I am sure there are other recipes but 1/4 cup each works well as a test and is inexpensive. I have done it w/ reusable wipes in a container and in a spray bottle as well. Good luck. I saw this recipe a couple of years ago, tried it, and been using it ever since. This stuff is like WOWSA!!! I also use it in my sink and toilet. My tub, sink, and toilet never shined brighter. Thanx for this. You totally rock!! Would replacing the baking soda with borax work as borax and baking soda are similar chemicals (both bases) but borax does not react with vingar? I use the all purpose cleaner 1/2 cup vinegar, 2 tbsp borax, 1 tbsp dish soap + 3 cups water absolutly everywhere and have bulk borax on hand? 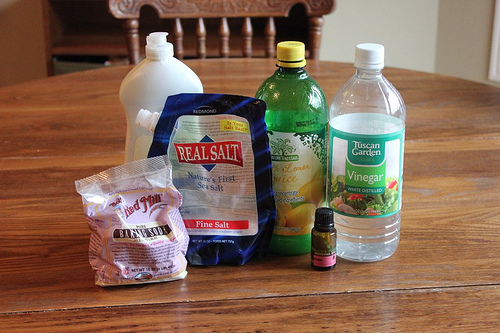 I have heard baking soda/vinegar recipes arnt as effective as borax/vinegar recipes? Has anyone tried both? Vinegar is acidic and not good to use on grout, so I’m not sure this would be a good tile cleaner.